In the Gospel of Matthew, Jesus asks, "Do you think worrying will add a single hour to your life? Why do you worry? Consider the lilies of the field. They grow; they neither toil nor spin." Every day we are baited into postures of fear and battle, anger and shame, greed and regret. Yet we hear from God over and over again: “There is joy in this world. And peace.” How do we find serenity in a world that contains suffering and struggle? Our answer is: together. We worship every Sunday Morning at 10:00 a.m. in our Sanctuary. (across the street from Framingham Centre Common). There is ample parking in the rear of our building. The Bell Choir prepares for worship. Learn more about our Faith Discovery program for children and youth by visiting our Families page. 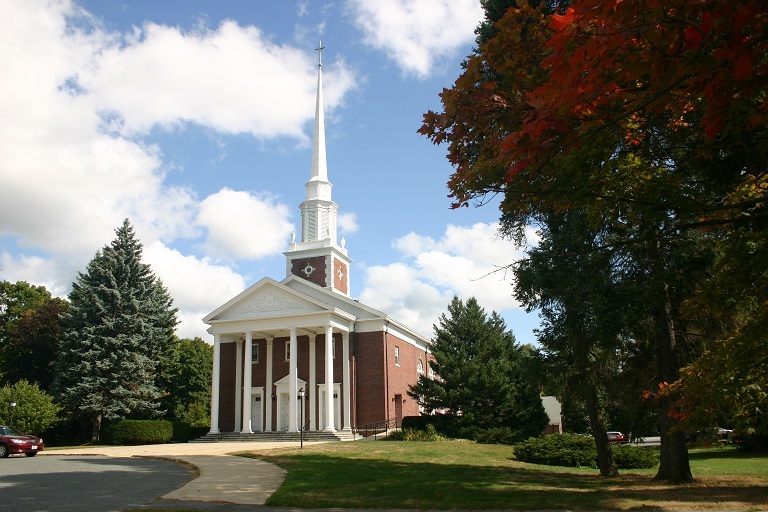 The Plymouth Church recognizes two sacraments: Baptism and Communion. Both sacred rituals are open and available to all persons. To learn about baptism, please contact one of our ministers. We celebrate Communion the first Sunday of every month. Located off a corner of our parking lot, tucked just into the woods, our Labyrinth is open to the public. It is a quiet place of dappled sunlight and soft breezes. We invite everyone to take in its mystery with a silent, meditative walk. For full details, photos, and a guide to its use, visit our Labyrinth page.